Walking. from Melissa Mensavage on Vimeo. It seems that every holiday sneaks up on me and I am finding myself scrambling last minute to make sure we do the typical festivities. For example, I totally screwed up and we never really got to see Santa. Grandma and Ginga did take the boys to see Santa while I was at work, and by the time they went, I didnt care I wasnt there but in reality, I wanted to be there. Anyway, since I never thought to buy an egg coloring kit to you know, color eggs for the holiday, I found a recipe for Easter Nests. You know the chow mein noodles and such?? This is a version of it. I think they look nice, they taste okay, but I am not sure this is the best recipe. Either way, Max had fun putting the eggs in the nests. He did awesome, I told him two big eggs and two small eggs. Look at his master piece! I love that he rolled up his sleeves to get to work. I love him. Here's the recipe in case you want to give it a try. I did do a taste test of the nests, and really they arent all that bad. The only trouble I had was with the shaping of the nests, I had to chill the mixture for a good 30 minutes prior to, and because of the marshmallow creme my fingers got sticky rather quickly. I just washed my hands several times, but I am sure you could use powder sugar. Enjoy! *you could very well use raisins, nuts, peanuts, etc. mix marshmallow, peanut butter and butter until smooth. Add chow mein noodles. Chill. On waxed or parchement paper, form mixture into nests. Add toppings, chill again for 30 minutes. Everyone says they are multi-tasking, myself included. Honestly I think its just second nature to me these days with two kids and all. One of the things I've been missing quite a bit lately is reading. A while back my dad suggested books on CD. I filed that suggestion away, knowing it was a good idea and someday I would do it. This past Sunday was the day I did it. At our weekly trip to the library we ventured to the adult section for this mama to get a book....on CD. I am totally into this book, The Help. I've been listening during my commute from/to Grandma's on Tuesdays and Thursdays. I am loving it. We even checked out a Thomas book on CD. They listen to books on CD at school, so its not anything new to Max. This morning I popped The Cranky Day CD into the player and Max sat quietly in the back seat, listening intently. My hesitation of deviating from the traditional book reading (you know where you open a book and turn pages) is starting to ween...just a little bit. This was a BRILLIANT idea. Thanks Dad!! Outside of the fact that I love baking, I have been focused on not putting so many artificial ingredients in our bodies lately. So I was flipping through some fundraising cookbooks I have in the house the other night and came across a recipe for cinnamon bread. The recipe was complicated and required a lot of effort, and then I had a thought. How could I simplify this like those box mixes?? Mix all bread ingredients together (i used my electric mixer and mixed on medium speed for 2 to 3 minutes). Pour half batter into bread pan. 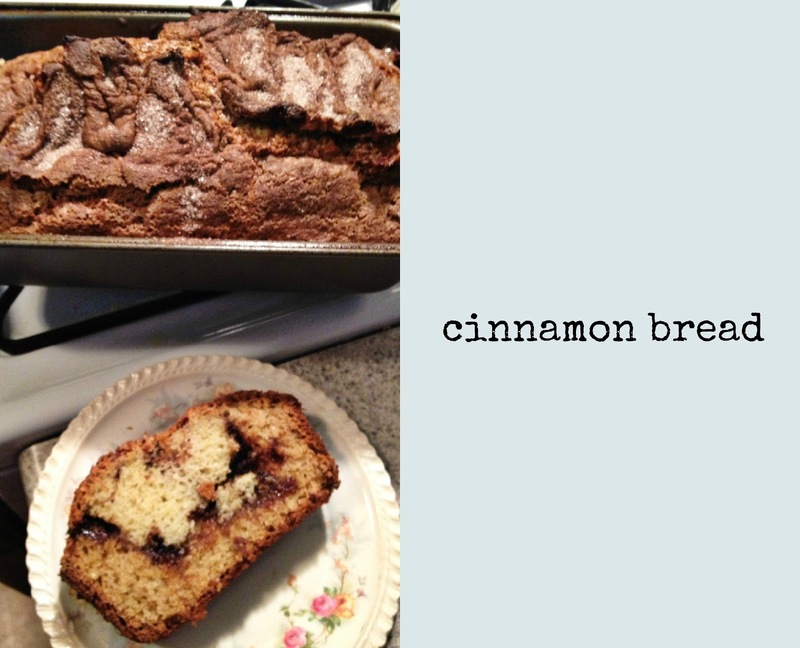 Mix the cinnamon and sugar together and pour half over batter in bread pan. Pour the remaining cinnamon and sugar last. Take knife and gently swirl batter. ps - to make the buttermilk, i simply use 1 tbsp white vinegar and about a cup of milk. let sit for 5 minutes. Also, a warning. Max is on this kick of 'lets spin and spin and spin...' until he makes ME want to puke. Theo on the move. from Melissa Mensavage on Vimeo. Round and round he goes. from Melissa Mensavage on Vimeo. You are getting very sleepy... from Melissa Mensavage on Vimeo.